Funeral services for Jacqueline Mae “Jackie” Bowman, 90, will be held at 11:00 A.M. Monday, April 22, 2019 at the First Christian Church in Wheatland, Wyoming with Pastor Casey Schroeder officiating. Interment will be in the Wheatland Cemetery. Jackie Bowman died Sunday, April 14, 2019 at the Platte County Memorial Hospital in Wheatland. Jackie was born Tuesday, October 16, 1928 in Fort Laramie, Wyoming the daughter of Jackson Joaquin and Laura (Snell) Latta. She was raised and educated in Fort Laramie and graduated from the Fort Laramie High School. Jackie married Theodore “Earl” Bowman on November 23, 1947 in Fort Laramie. They raised their family on the family farm-ranch in Dwyer area north of Wheatland, where they raised wheat, barley, hay, and Angus cattle. She worked for Safeway for 20 years. They moved to Guernsey in 1990, to Fort Laramie in 2002, and following Earl’s death she returned to Guernsey. Jackie spent her last years in Wheatland, where she resided at the Country Club Living and Legacy Assisted Living. 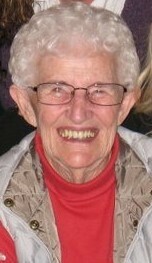 She and Earl were avid Wyoming Cowboy fans and were involved with three pinochle clubs, which they thoroughly enjoyed. She is survived by her children, Jim Bowman, Vicki Bowman, Randy “Butch” (Becky) Bowman all of Cheyenne, Wyoming, Jon Bowman of North Platte, Nebraska, and Biff (Ross) Gorman of Douglas, Wyoming; 12 grandchildren; and 25 great grandchildren. She was preceded in death by her parents; husband, Earl, on December 22, 2005; sister, Patricia Ann “Patty” Milligan on November 19, 2009; brother-in-law, Robert S. “Bob” Milligan Sr. on February 9, 2015; and two great grandsons, Jaxen Rahmig and Christopher Himes. A memorial to the Guernsey Senior Citizens Center, P.O. Box 765, Guernsey, Wyoming 82214 would be appreciated by the family. Serving as pallbearers will be Andy Bowsher, Geoffrey Gorman, Cameron Dean, Danny Punches, Dean Rahmig, and Nate Rahmig. Family and friends may call at the church in the Fireside Room on Monday from 9:00 A.M. to 11:00 A.M.